Is Your Tradjenta Medication Too Expensive? Learn How People Are Paying A Set Price of $50 A Month For Tradjenta Through Prescription Hope! Are you looking for a place to get your Tradjenta (Linagliptin) medication at an affordable price? 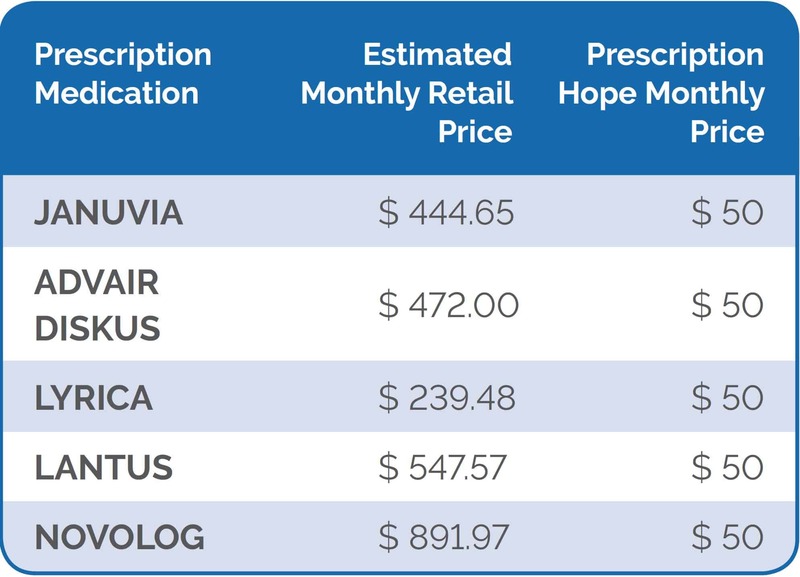 Prescription Hope offers the top prescribed diabetes medications prescribed on a national level including Tanzeum, Starlix, NovoLog, Humalog, Jardiance, Glyxambi, Micronase, Actos, and many more all for the set cost of $50 per month for each medication! Prescription Hope is NOT a prescription discount card or an insurance plan. If your Tradjenta cost is too much, Prescription Hope can help. Do I Qualify To Get My Tradjenta Medication Through Prescription Hope? Both individuals and families earning less than $100,000 per year may qualify for Prescription Hope. If our advocates cannot obtain Tradjenta for you, we will never charge a fee for that medication. Once you apply for Prescription Hope, our knowledgeable advocates work for you to manage, track and refill medications on time, maintain up-to-date records, and renew prescription medications every year. Once your application is approved, the first shipment of prescription medication typically arrives within four to six weeks, with refills coming on a consistent basis. Is Prescription Hope a Tradjenta Coupon, Discount Drug Card, or Insurance Plan? Prescription Hope is not a Tradjenta coupon, discount drug card, or insurance policy. This is also not a Tradjenta generic. Instead, Prescription Hope obtains your brand-name medicines directly from the U.S. based pharmaceutical manufacturers and their pharmacy. Although Prescription Hope is not a Tradjenta coupon, individuals that are looking for a Tradjenta coupon can find more savings through Prescription Hope! Can I still Use Prescription Hope For Tradjenta If I Have Insurance Coverage? Tradjenta is one of many common medications prescribed to adults struggling with type II diabetes. The Centers for Disease Control estimates as many as 29 million Americans struggle with the disease, making Tradjenta a life-saving medication. When prescribed by a doctor as part of an overall treatment plan, individuals can take better control of their overall health. For more questions about Tradjenta including other treatment options and possible side effects, please consult a physician. Those prescribed Tradjenta may be able to access prescription medication with the help of Prescription Hope. As the nation’s fastest growing pharmacy program, Prescription Hope can obtain over 1,500 FDA-approved prescription medications from over 180 U.S. based pharmaceutical manufacturers for the set price of $50.00 per month per medication. Apply today, and begin obtaining your prescription medications at an affordable price through Prescription Hope.